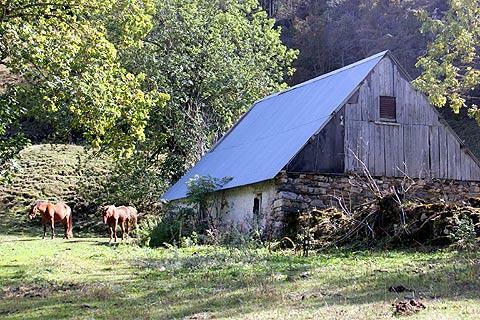 Gavarnie is a small village about 25 kilometres south of Luz-Saint-Sauveur, in the French Pyrenees and close to the border with Spain. 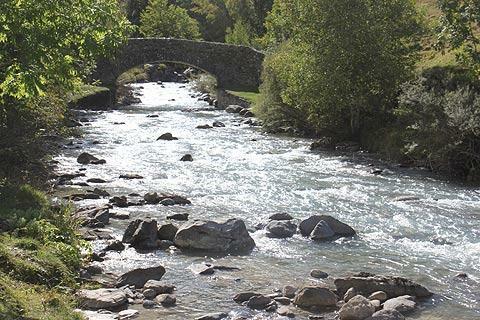 The village of Gavarnie itself is easily reached by following the scenic road south from Luz-Saint-Sauveur. The village contains various commerces such as a couple of hotels, several small shops and restaurants, and various businesses set up to cater to visitors intending to visit the Cirque de Gavarnie, such as donkey hire stations. 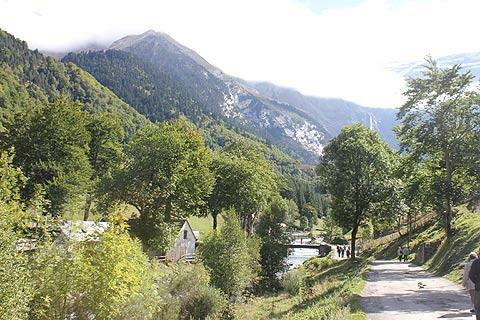 The main historical monument in the village is a 12th century church, the rest of the village having developed around the long established attraction of the cirque itself. The cirque de gavarnie is a large natural amphitheatre formed by a very high cliff, and with various waterfalls tumbling down the cliffs, including one that is said to be the highest waterfall in Europe. The site is officially classified as one of 30 'Grand Sites of France'. When you first arrive in the village by car the cirque gives the appearance of being almost in the village itself, but this is a deception caused by the sheer height of the cliffs, which are up to 2000 metres high. In reality the cirque is about three kilometres from the main village, a walk that takes about an hour in each direction. The path is well maintained and easy to follow, uphill in places but never particularly challenging. Although walking shoes are more appropriate it is certainly possible in trainers in dry weather. There are plenty of places to stop for a picnic en route. 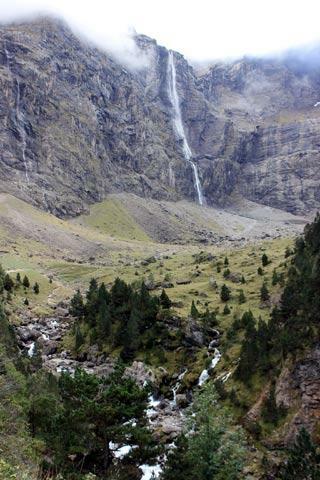 Much of the path follows the route of the gave de Gavarnie, the stream which starts in the cirque. It is very picturesque, and if you don't feel able to walk we suggest you hire the donkey rides available - likewise if you are visiting with small children these will make your life much easier (if slightly more expensive)! The crest of the cirque is also the frontier with Spain, with Mount Perdu adjacent and also on the frontier. It was clear when I visited that the majority of visitors to the village of Gavarnie do not actually make it to the cirque - the village was very crowded, but almost no-one else was at the cirque. This note is just to emphasise that the cirque is the reason for visiting Gavarnie and is highly recommended if at all possible. You really are missing out on something special if you come all this way and then fail to see the spectacle of the waterfalls and the massive cliffs! There are one or two hotels in the village of Gavarnie and also one in the village of gedre a few kilometres to the north. A much wider choice is available at Luz-Saint-Sauveur, a 30 minute drive to the north. 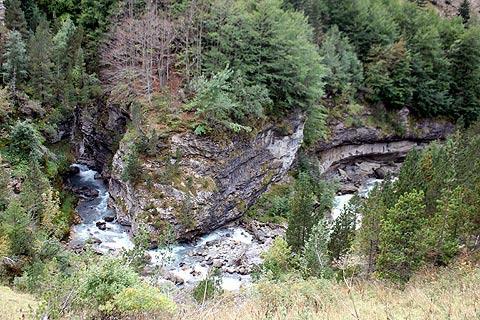 A useful sign at the cirque de Gavarnie explains the geological formations in front of you. There are essentially several different layers visible, which were laid down when the mountains were below sea level. Geological movement then moved them up to become mountains, and glaciers during the last (and preceding) ice ages eroded the terrain to create the cliffs we see today. The unique situation of the cirque de Gavarnie also made it one of the first centres for climbing in the Pyrenees, and in recent years it has also become a popular destination for climbing ice waterfalls. 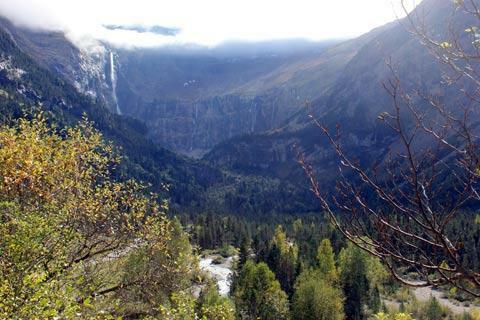 If you have reached Gavarnie you will be aware that it is the scenery with its mountains and passes that is the main attraction for visitors to the Pyrenees National Park. 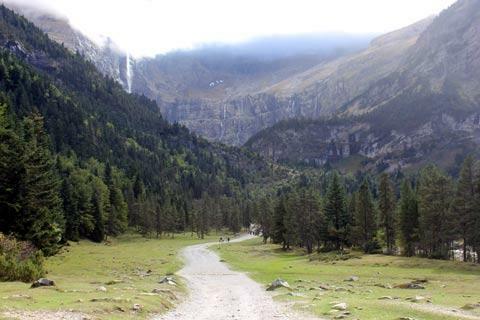 It is worth noting that here as elsewhere in the Pyrenees there are trails for all levels of hiking ability - ask in the tourist office and they can recommend walks that are quite level and suitable for children and the less ambitious. 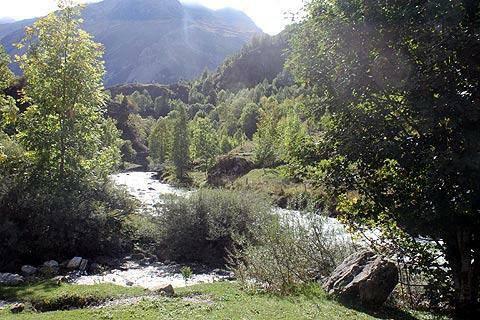 More ambitious hikers will find endless possibilities with the ambitious heading towards Mount Perdu or elsewhere in the mountains south of the cirque de Gavarnie and cyclists can follow the Col du Tourmalet or other great cycling routes through the Pyrenees.